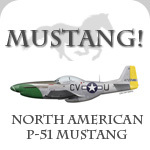 This is a list of books on the Mustang, either about the Mustang itself or the men and units who flew it. These books have been rated, when reviewed, into four categories, but please read the reviews to get a better idea of their contents. If you wish to submit a book, or add your own review to this list, please contact us.